In the West it is a normal assumption that the primary spiritual practice of Buddhism is meditation. The two words go hand in hand, and it is imagined that the average Buddhist spends many hours a day in full lotus on the floor. But anyone who has spent any time in a predominantly Buddhist country will tell you that this is not really true. In my experience the vast majority of Buddhist lay people in Asia do not practice meditation, though many will claim it is a good thing to do. Even more surprising, most Buddhist monastics have no regular meditation practice to speak of. This is especially true in Vietnam, where monks and nuns are quite intergrated into the community, and lead busy lives of social and religious organisation. 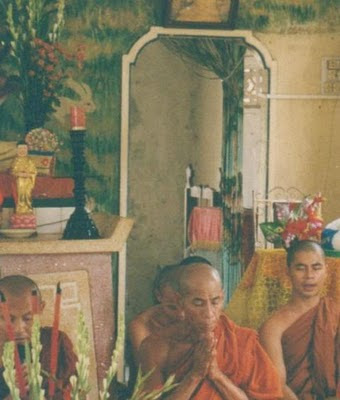 Apart from counselling, the provision of charity and other pastoral work, the main work of monastics in Vietnam seems to be the administration of temples (especially overseeing extensions, repairs and other building work), the care of younger monastics in their charge, conducting daily prayer sessions, making themselves available for memorial ceremonies, planning festivities for religious holidays and the study of religious and other topics - probably in that order. I can honestly say that, in the course of 16+ years study and travel in Vietnam and having dozens of monastic friends, I have never met a single monk or nun in Vietnam who practices meditation in any consistent way. I have visited three temples there where meditation is the primary focus, but these tend to be isolated retreat centres, and viewed by the locals (and almost especially by other monastics) as exotic sites quite alien ot the general thrust of Vietnamese Buddhism. Of course, starting out as a young Buddhist this all came as a terrible blow to me. Almost from the beginning of my interest in Buddhism I had carefully and conscientously attended meditation classes and pursued my own meditation practice at home. I was (I am) a great fan of the writing of Vietnamese Zen Master Thich Nhat Hanh, and had assumed that he was describing the standard of Vietnamese Buddhism. Staying in Vietnamese monasteries I became increasingly frustrated at the absence of what I then considered "proper" practice. I would ask the monks when they meditated and they would look at me in a confused and apologetic manner. I looked down on them - this wasn't the way things were meant to be. I was the original religious imperialist. But when I came back to Australia I made the acquaintance of a very senior Vietnamese monk, and he explained that this obsession with meditation as the singular and superior form of Buddhist practice was a recent Western phenomenon. He convinced me that a life well-lived, engaged with the lay-people, trying to meet their all-too-worldly expectations and alleviate their existential anxieties was work enough for most monks. Their meditation was in an active form, either in chanting the sutras or reciting the Buddha's name while using the rosary. The last time I was in Vietnam I spent a lot of time at one of the big temples in Ho Chi Minh City. My friend, a young monk who excelled in administrative matters and also spent a lot of time blessing the statues for people's home shrines, pointed out a large new building that had been added to the temple complex. "Oh, a zen hall - for the monks to practice meditation. An overseas Vietnamese paid for its construction." I was shocked because I had never witnessed this community in meditation. Indeed, I'd never even heard the word mentioned before. The look on my face must have been obvious, because my friend smiled and patted me on the arm reassuringly. "Never once been used for the purpose," he said with a laugh. "But it's an excellent spot for visiting monks to sleep in when they are here."